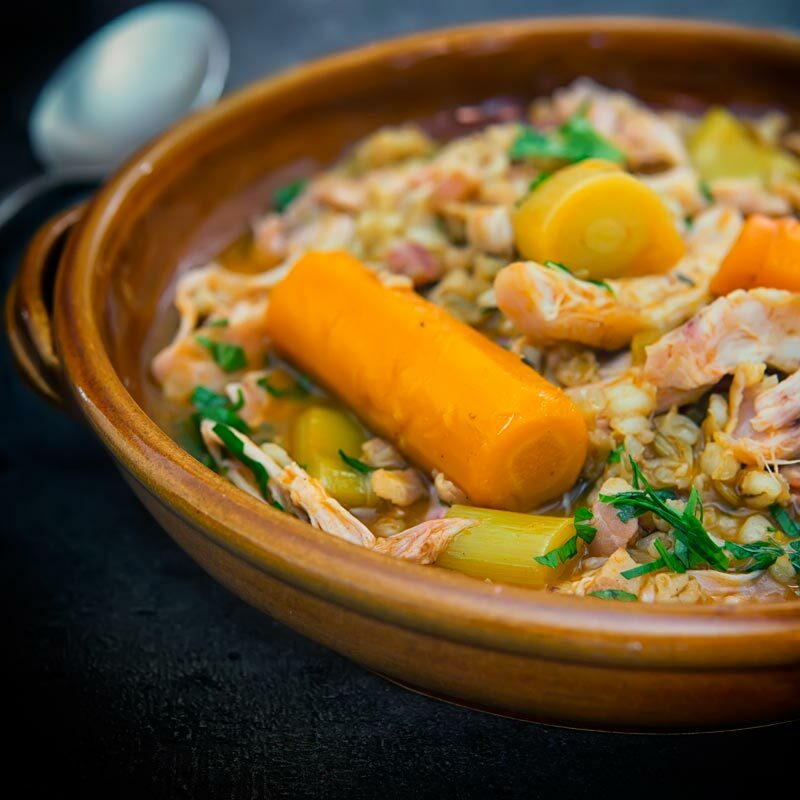 A good easy rabbit stew is as old school as it gets this one is delightfully frugal, packed with flavour and features the much-underused pearl barley. 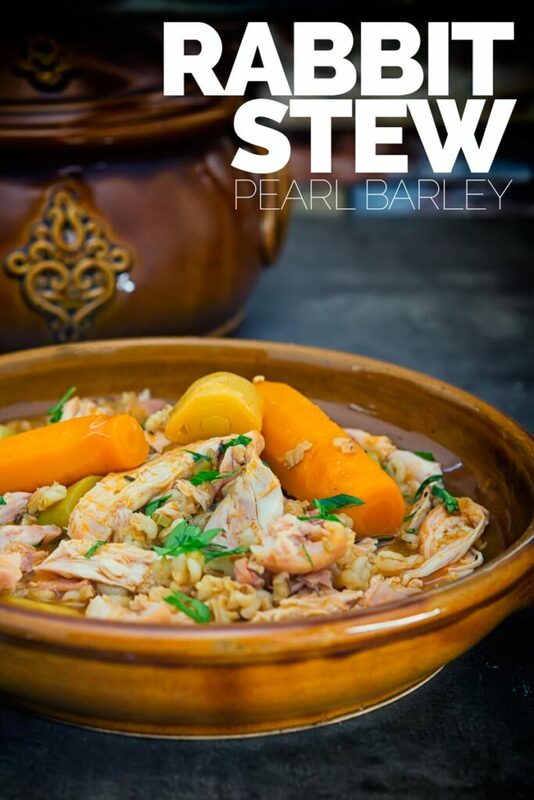 Rabbit Stew with Pearl Barley! I’m kicking off my slow transition to autumnal food with a delicious and simple rabbit stew recipe. Yes, I’m being all populist again with my fancy old-fashioned ingredients and traditional cooking methods. 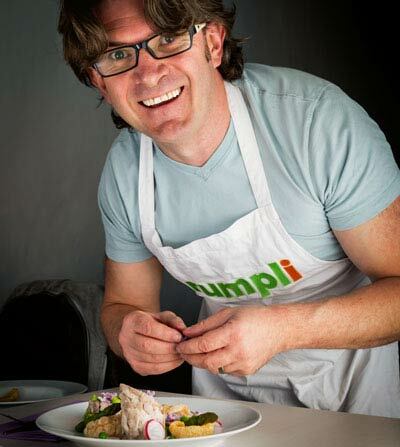 This recipe is not my first rabbit recipe here on Krumpli. It joins a rabbit tagine, a pot roast rabbit pasta and a rabbit ragu. This recipe, however, is a little closer to home and is very British indeed. It is the sort of thing that would make my gran smile a great deal! Rabbit was one of the sources of protein that was not rationed during WWII in the UK and during the rationing period after. As a result, it became understandably a popular ingredient. I genuinely love the stuff, it has a wonderfully subtle flavour that is nothing at all like chicken! So forget everything that you have ever read. It is exceptionally lean and has a tendency to dry out when cooked quickly. Consequently, this slow simmer approach of the bony leg cut is the perfect foolproof introduction to cooking rabbit. Wait for it folks, pearl barley is… Wait for it… Barley! Ok, it is barley that has the inedible husk removed and then polished to remove the bran. It is a pretty ancient ingredient often associated with ‘padding’ frugal dishes. I personally love the flavour it is kinda nutty and has the most wonderful chewy texture. It is used here in this rabbit stew in a similar way to the way I use it in my cockaleekie soup. Yes, you read the right, and yes you have to click the linky thing to find out more! In some ways it is there to provide bulk, but in the main, it is there for texture and flavour. 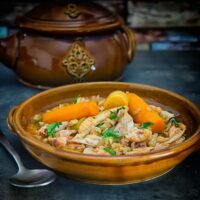 This recipe is a slowly simmered stew, which means the vegetables in it go soft… You could add in the vegetables later but then you would lose the wonderful depth of flavour you get from them. They enhance the stock and that flavour gets all sucked up by the barley. The pearl barley then takes centre stage for texture in this dish preventing everything being a little ‘soft’. Pearl Barley is also the base ingredient of Orzotto, a north Italian sibling dish of risotto. Most importantly a dish I really must share with you this winter! Traditional Recipe, Traditional Cooking Method. It is very easy to get carried away with all sorts of kitchen gadgets. 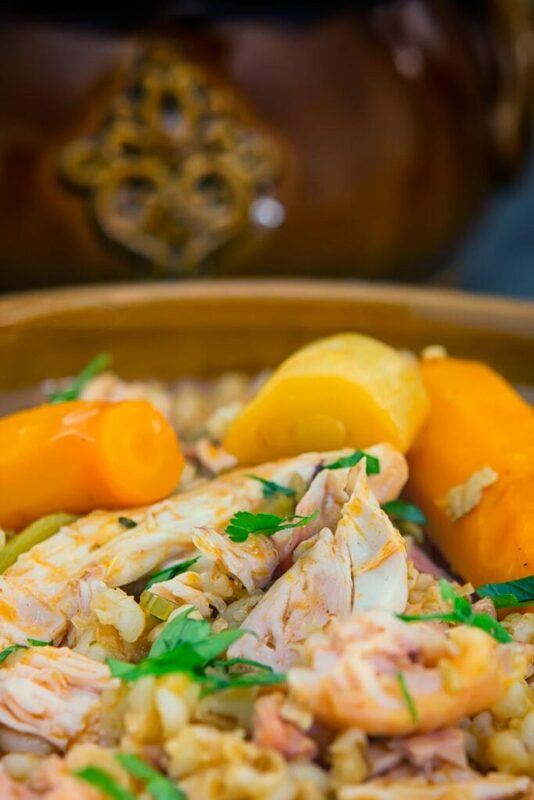 You could, of course, cook this traditional rabbit stew in a pressure cooker or slow cooker. There is, however, no need! A pot simply simmering away on the stove works every bit as well as other methods. There is nothing fancy going on here and involves nothing that my grandmother would have been surprised to see. Even the fennel seeds are an ancient olde English ingredient with written references dating back to the 10th century. It has also long been seen as a great combination with rabbit. 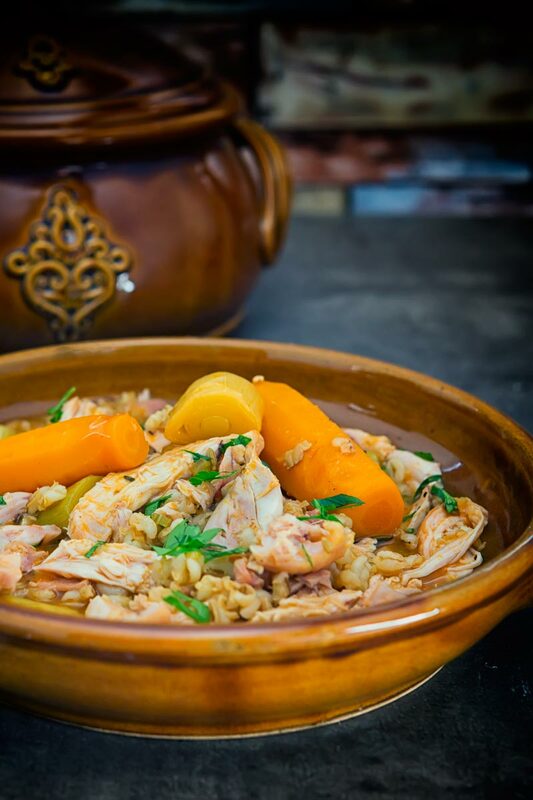 That light anise flavour with the subtle flavour of rabbit is wonderful! Anyway, autumn is coming and my long trousies will be coming out soon… Don’t worry I have plenty of autumnal ideas heading your way in the coming weeks and months! 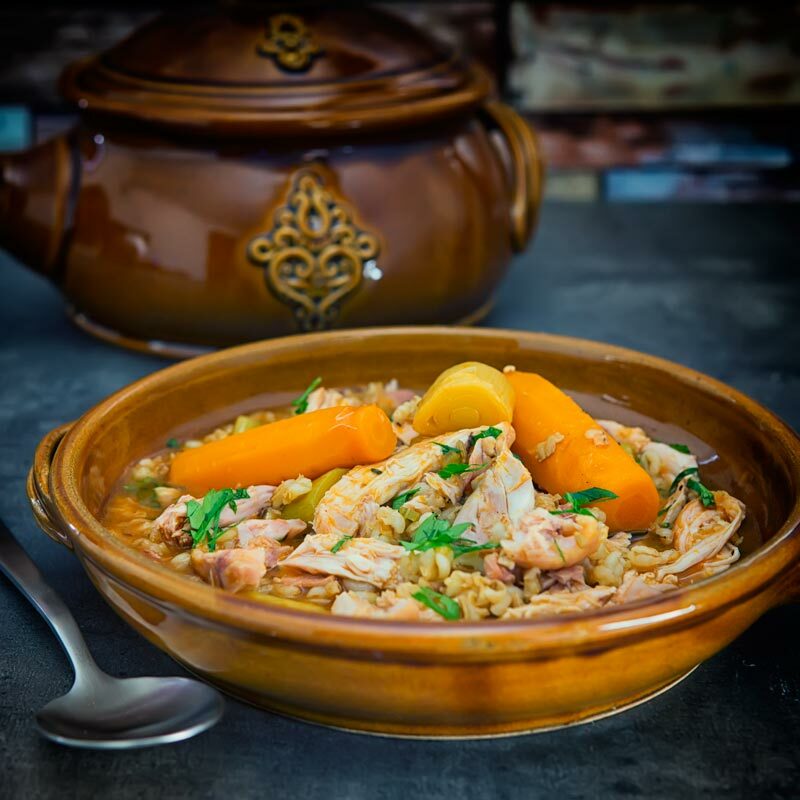 Rabbit stew may seem old fashioned and a little staid, but it is the most wonderful hearty meal. This one is bulked out with pearl barley and despite being filling remains wonderfully light. Season your rabbit legs with salt and pepper and then dredge with flour. Heat a medium sized pan over a medium high heat and when hot add the oil. Fry the rabbit legs until golden on all sides, remove and set aside. Chop the bacon and add into the pan and fry for a minute. Finely chop the shallot and the leek and add to the bacon, reduce the heat to medium and fry for 5 minutes. Cut your carrots into 5cm lengths and your leeks into 1cm coins and add into the pan along with the fennel seeds. Pour in the chicken stock, add the tomato puree and pearl barley and stir. Drop in the rabbit legs and the sprig of rosemary, cover with a lid and reduce to a gentle simmer for 75 minutes. When your stew is cooked remove the rabbit legs and shred off the meat, returning to the pan to reheat before serving with lots of fresh parsley. I’ve never had rabbit, but I have to admit this looks amazing! I’ll have to give this a try soon! Great information on rabbit and pearl barley which I’m neither super familiar with. Thanks for the tips and great recipe. This is a delicious and hearty stew for fall! The bacon adds a fantastic flavor along with the pearl barley. I absolutely love rabbit! This stew sounds just incredible, I’ll have to try it! I have eaten rabbit when on holiday, but I haven’t cooked it myself. This looks like a really hearty and delicious stew. It is really simple to cook and so tasty.